How is it that Thanksgiving is NEXT week? This year is flying by so quickly that I can hardly keep up. My kids just keep growing, life keeps moving, and our schedules keep getting crazier and crazier! If you don’t follow me on Instagram you may have missed a few of the recent things going on our in our lives. My daughter is a Junior Girl Scout this year and is really blossoming into a wonderful leader. My son is 15, learning to drive, got his first job, and opened his first bank account. My latest doodles and designs; like the one shown above!! It’s hard for me to get excited about Thanksgiving; which really isn’t any different from any other year. This is the most hectic time of year for our family and for my job. We host a huge Black Friday weekend sale and it’s very time consuming and exhausting to plan; however it’s a great reward when the weekend arrives and our customers flock to our store looking for deals!! My “work day” on Black Friday actually starts around 8 or 10pm on Thanksgiving as I fiddle with all those last minute things that didn’t get done ahead of time and trying to make the website look fabulous. It’s a long night so I tend to take Thanksgiving Day very easy and not over plan. We don’t do a huge family gathering and I’m not even sure what we’re cooking for dinner! I’m sure we’ll have the usual turkey, dressing and mashed potatoes…maybe! 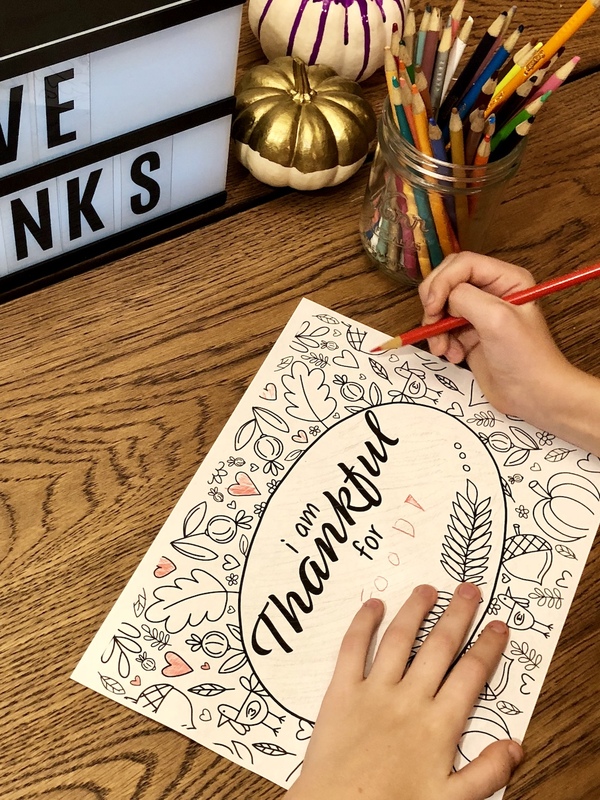 Even with all the hustle of the month I’m still thankful to be able to unwind at night with my iPad and my Apple pencil and create artwork to share with family and friends…and maybe even some of you! 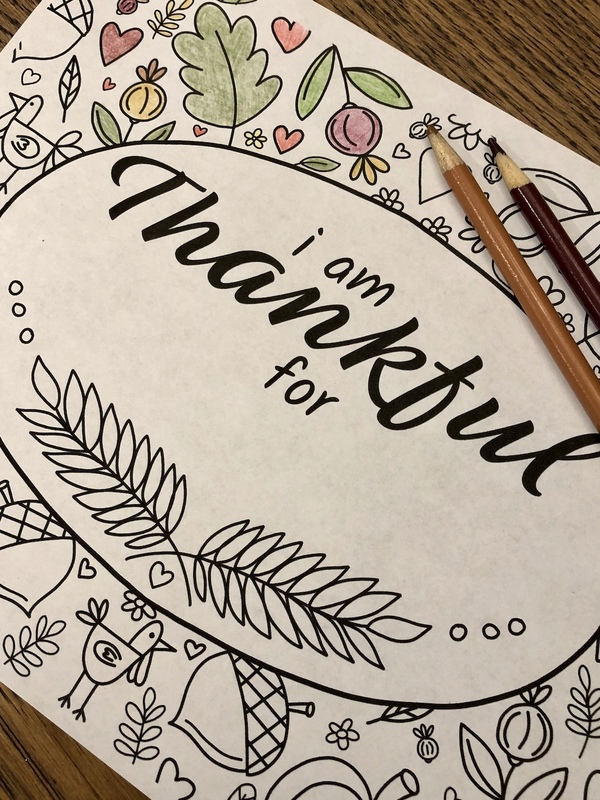 This piece is an “I am Thankful” Thanksgiving Coloring Placemat. It’s designed to be printed on 11″x14″ paper; however I realized that my home printer will only print 8.5″ x 11″ or smaller. 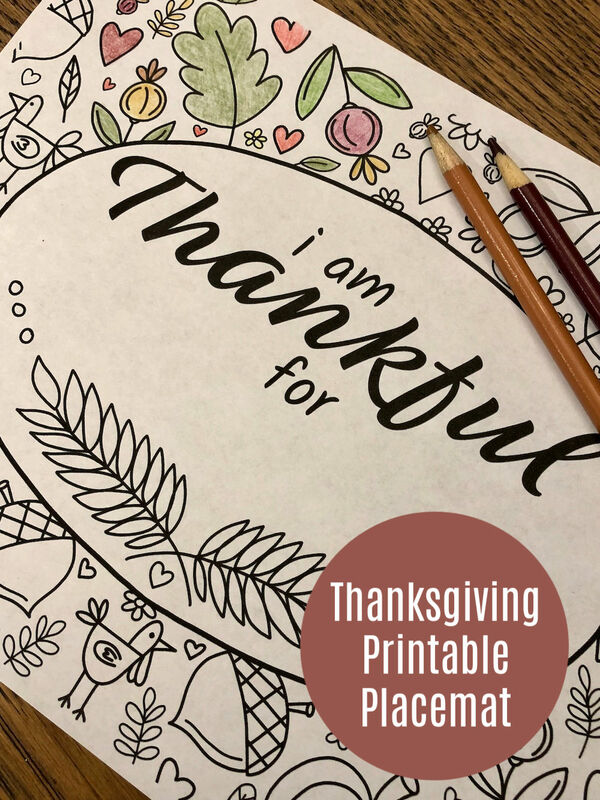 It still works as a coloring page; but might be too small for a placemat at that size. You can download and print the original artwork from my Etsy shop at 11″ x 14″ and “fit to page” if you are printing on a smaller piece of paper. Or you can take the file to your local copy store and have them print it for you. That lead me to research print on demand options. You can order copies that are already printed for you, there’s an option to do that from Etsy too. Just be sure to order them ASAP so they’re delivered before the turkey is served! It may take up to 5 days to get them. 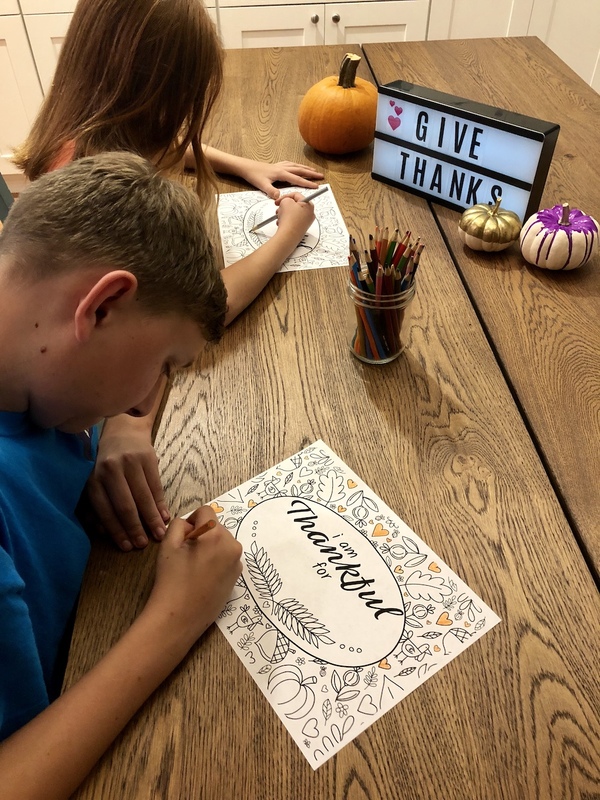 When you set the table on Thanksgiving don’t forget to set the crayons, colored pencils, and markers too so your guests can color in their placemat and share what they are thankful for. 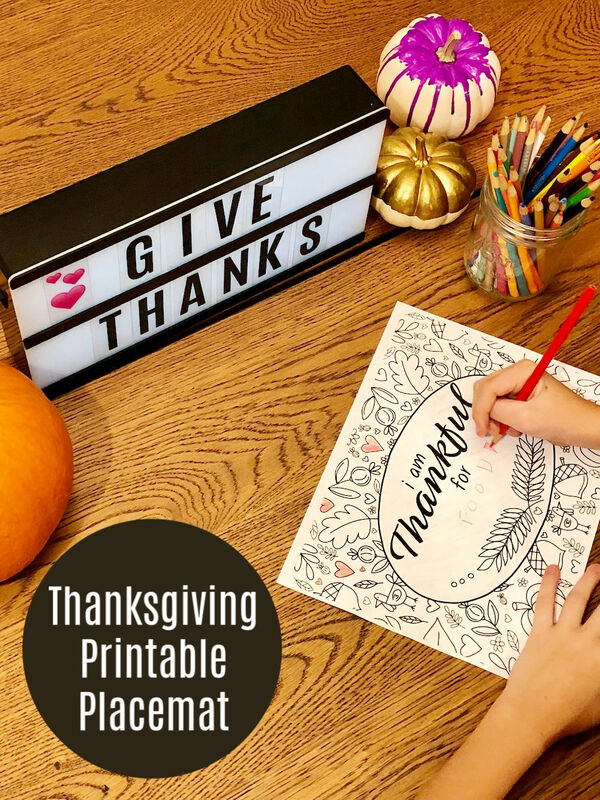 I printed a few copies at home this afternoon and it was a relaxing way to unwind and connect with the kids after dinner. If you use them on Thanksgiving I’d love for you to share some pictures with me on social media! Just tag @backtocalley in your post so I can see them!